Security is important and one of the things I would like to see is if we can enforce a requirement for all requests that core makes back to WordPress.org for updates and information to be https. This is the a great step to a greater level of update verification to help detect man-in-the-middle attacks. Making this switch is going to be a fun journey and we are bound to find that there are some setups that can’t/don’t/won’t support https with the WP_HTTP API. So before we try switching to using https in trunk I’ve update the Beta Tester plugin so that it forces all requests to api.wordpress.org to happen over https. I’ve also updated the api so that if you make a https request it will return https references in the results. Please go for and test this on your test installs and let us know of any issues you find here in the comments or on the trac ticket. It’s been a long time since I’ve posted here and I feel like today is the special day when I should start trying to rebuild this blog, adding more content and giving it a lick of new paint. So I’ve switched to Twenty Thirteen, and here is the first short post of hopefully more to come, for more about my WordPress journey so far head over to my personal blog. One of the things I find myself doing a lot when developing WordPress is debugging things and so I spend a lot of time thinking of ways I can make this easier for me and easier for everyone else. Overtime this had led to a number of significant improvements to the debug ability of WordPress core including things like WP_DEBUG and the Deprecated Notices as well as the development of great tools like the Debug Bar plugin. Recently I’ve found that the more context you can get to an issue the easier it is to understand and debug and I also noticed that while we recorded a simple backtrace for queries in core when SAVEQUERIES was defined we didn’t do a good job of presenting the data. Some function calls need more context that just the function name to be most useful – such as when running an action/filter it is useful to know the name and when requiring or including a file is useful to know the file name and some path context. This lead to the idea of refactoring the backtrace capture functionality out of WPDB and into a function that was improved to give proper calling syntax for functions in classes when called statically and was more obviously re-usable by plugins like the Debug Bar. So today I have introduced wp_debug_backtrace_summary( $ignore_class = null, $skip_frames = 0, $pretty = true ) for #19589. If you provide no arguments you will get back string containing the full trace of the code run up to the place where you call wp_debug_backtrace_summary() – you won’t see the call to it in the trace as it always hides itself. The best way to see the difference and improvements is to look at how this improves the information in the development version of the Debug Bar (new release coming soon) so after the break I have included some before and after screenshots. One of the features being introduced in the upcoming WordPress 3.1 release is the new Admin Bar. This is designed to make it easier to get access to the more common administration area tools from the front end of your site but also introduces the possibility to easily integrate extra debugging features into your site for use in testing environments or production environments to help track down things like slow queries, PHP notices and warnings, and usage of deprecated functions. 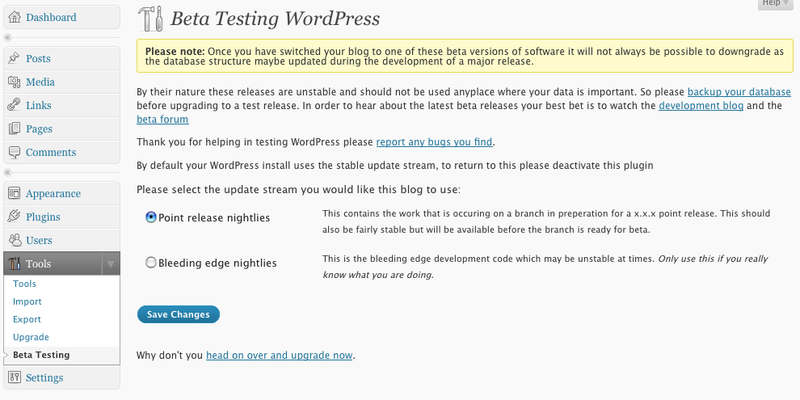 During the development and RC phase for WordPress 3.1 some of the core development team have worked on building a plugin which adds these debugging features to any site running WordPress 3.1 or later. The plugin started out with a very basic feature set just including MySQL query debugging information and statistics from the installed object cache based on the code that is used on WordPress.com. Overtime we have added reporting of PHP notices and warnings, Logging of calls to the things that are deprecated (code derived from the Log Deprecated Notices plugin by Core Developer Andrew Nacin) and information about the WordPress Query being run as well as how the current request has been parsed by the WordPress rewrite engine. The plugin requires WordPress 3.1 as it hooks into the new Admin Bar and I’m sure will be of great use to all WordPress core, plugin, and theme developers.